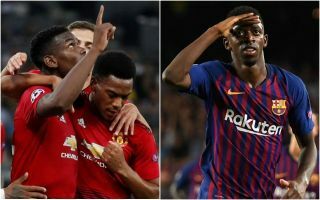 Barcelona superstar Lionel Messi reportedly wants his club to sell Ousmane Dembele to make room and raise funds for the transfer of Manchester United midfielder Paul Pogba. This would involve a tactical change in Ernesto Valverde’s line up, with Messi supposedly favouring Philippe Coutinho moving further forward to partner him in attack while Pogba links up with Ivan Rakitic in midfield, according to Don Balon. It remains to be seen quite how much say Messi has over Barcelona’s transfer activity, but he is the club captain and of course one of their best players of all time. If the Argentine would be happier getting rid of Dembele and bringing in Pogba, the club may well consider it, especially as there seems to be some logic behind this move. Ousmane Dembele to leave Barcelona? Coutinho’s dribbling and goal threat means he might be better off in a front three as he often played in for Liverpool, while Pogba is a better all-rounder in midfield, capable of combining strong defensive work with a wide range of passing and the occasional goal from the middle of the park. The France international has struggled at Old Trafford but may be a far better fit at the Nou Camp due to the style of play and the superior team-mates around him.